This guideline covers stop smoking interventions and services delivered in primary care and community settings for everyone over the age of 12. It aims to ensure that everyone who smokes is advised and encouraged to stop and given the support they need. It emphasises the importance of targeting vulnerable groups who find smoking cessation hard or who smoke a lot. VApril, the new pro-vaping campaign, was launched yesterday. It’s early days but the signs are it won’t be the four-week festival of anti-smoking rhetoric some may have feared. Indeed, what I like about the VApril website is that it focuses on the positive (the potential health benefits of vaping) instead of the negative (the often hysterical arguments against smoking). The introduction of heat-not-burn cigarette substitutes in Japan has led to a precipitous reduction in cigarette consumption. Tobacco industry analyst Michael Livery of Piper Jaffray recently issued a report on the Japanese market, citing 2017 sales data. The chart at left suggests that Philip Morris International’s IQOS heat sticks (green) and BAT’s Glo products (blue) caused a 13% decline in cigarette consumption for the year. One thing I absolutely love about e-cigarettes is that the War On Smoking has resulted in the invention of a whole new way of smoking. It’s what happens in wars. They always result in the invention of brand new weapons. And e-cigarettes are to the War On Smoking as tanks were to WW1. They’re still in their infancy. But one day they’ll be everywhere. A Wellington court gave Philip Morris International (PMI) the go ahead to sell its Heat not Burn (HnB) device iQOS, after dismissing a case by New Zealand’s Ministry of Health. Earlier this month the Ministry of Health took PMI to court, arguing that selling HEETS is against local law as they would fall under the country’s “Smoke-free Environment Act’s” ban on tobacco products for chewing or any other oral use. The paper “Association of E-Cigarette Use With Smoking Cessation Among Smokers Who Plan to Quit After a Hospitalization” sought to find out if vaping worked as a quit tool. Stanton Glantz praised and promoted it, at which point things went a bit sideways. The logic of Glantz and the research team has been unpicked, laughed at and sent some unprintable images. The Science and Technology Committee heard from representatives from the prison service, NHS foundation trust and interest groups to explore how e-cigarettes are promoted to those trying to stop smoking, including those experiencing mental health issues or serving a sentence in a prison. NJ Governor Phil Murphy outlined his proposed 2019 budget which includes a 75% “Vape Tax”, a measure in which was designed to increase revenue for the expanded spending budget. However, instituting any tax on the industry would likely take away MOST of the revenue the vapor shops, wholesalers and labs already contribute to an almost bankrupt NJ. Last Wednesday, the FDA Commissioner Scott Gottlieb, said that the agency is looking into regulating over-the-counter e-cigarette sales as this would make it easier for the agency to monitor safety standards. Last August, the FDA announced a major shakeup to the agency’s policy on e-cigarettes which includes the de-nicotinization of cigarettes, and a PMTA deadline delay. Following that announcement, the FDA had issued a guidance titled Extension of Certain Tobacco Product Compliance Deadlines Related to the Final Deeming Rule, in order to formalize and explain this deadline extension. A group of anti-tobacco groups led by Campaign for Tobacco-free Kids have gleefully announced that they are suing the FDA. 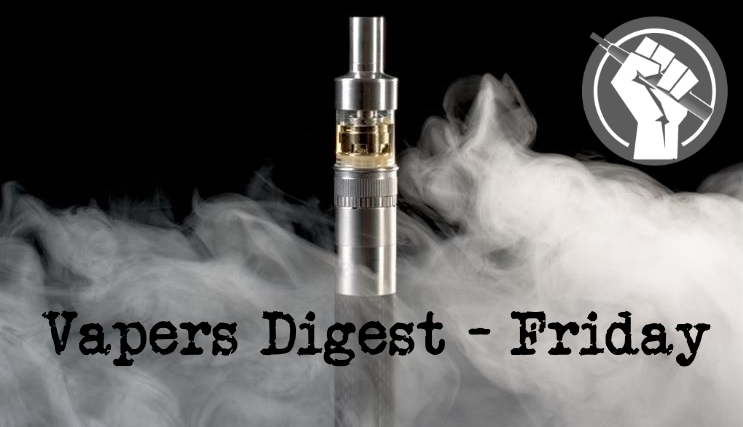 They demand that the FDA reverse the decision to delay implementation of the near-ban of vapor products, from the original deadline later this year until 2022. There is little doubt that the lawsuit will fail. So the interesting question is why are they doing it. In November of 2017, CASAA assisted ECigIntelligence in conducting a focused survey of vapers. The integrity of ECigIntelligence was verified, as was the purpose and scope of the survey, and the survey was circulated to our members via email.As a part of our diligence to our members, CASAA is publishing the relevant results to educate and advocate for our members. With Tennessee having one of the highest adult smoking rates in the country, it is critical that our public policy on tobacco and nicotine reflect science rather than outdated claims. The scientific evidence shows vaping is a significantly less harmful alternative to smoking and is helping smokers around the world quit for good. Federal Health Minister Greg Hunt is being held over a political barrel by a “critical’ number of senators in regards to his stance on the use of nicotine containing e-cigarettes. The sale of electronic cigarettes containing nicotine – classified as a poison – should remain prohibited in Australia, a parliamentary committee has concluded after a year-long inquiry. In its much anticipated report, the majority of the Standing Committee on Health, Aged Care and Sport supported the status quo, saying “current regulatory arrangements for nicotine e-cigarettes remain appropriate” and “further research into the health impacts is needed”. Unable and unwilling to enforce a number of no-smoking bans, the Greek government now has been told by a high court that e-cigarettes are just the same as cigarettes and should be banned in public spaces, transportation and advertisements. A total of seven retailers were hit with fines and had illegal goods confiscated and destroyed as part of a widespread campaign in Al Hudaiba, Bur Dubai and Al Murar. Municipality inspectors seized 30 electronic cigarettes from 11 outlets, as well as 100kg of tobacco that was being sold in illegal packaging. Back when the tax parasites in tobacco control set their sights on plain packaging for tobacco, they were very clear about why the policy was required. If you live in the south west, you may remember this advertising hoarding at the time, paid for by government to lobby government in early 2012. Data produced by the National Institutes of Health and the Food and Drug Administration has been analysed by a body kindly disposed to vaping, and it produces results that mirror those previously obtained. Meanwhile, in Hawaii, the frothing at the mouth taking place threatens to eclipse all sight of a news program from television, as they hit peak vape fear-mongering. Do you remember going to see the careers guidance officer? At least that is what they were called when I was at school, I believe following continual cutbacks that the Department for Education has issued all institutions with a dartboard labelled up with all the options. Spotty hormonal teenagers now shuffle down a dank corridor, pick up a blunt set of arrows and have three opportunities to land one of the two placements in their town.